“They should fix this place up” Rupa decided over our martinis at the Ciel de Paris. Seeing the scuffed bar and chairs, dated decor and dingy carpet, I agreed. But, the thing is, they don’t have to. Where else in Paris do you get this view over drinks? Once the sun goes down, the wear and tear is no longer apparent and you can just enjoy watching the city beneath you twinkle. 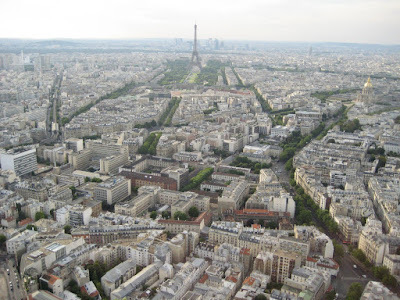 Last Tuesday, the two of us had met on the 56th floor of the Tour Montparnasse for the last night of her Parisian visit. Not being bound my usual Wednesday rules, I could have ordered anything, but took a martini anyway. I was not asked “shaken or stirred”, “lemon twist or olive” but instead “ice or no ice?” I choose “no ice”. I watched, from a distance, as the bartender made my drink at the nearby piano bar. What I got was a chilled glass, a good pour of Gordon’s, a whisper of Nouilly Pratt, stirred long enough to make it nice and cool. It was accompanied by a small dish of toasts and tapanade. 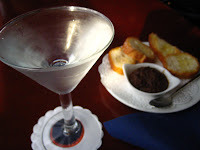 My 15 Euros martini was perfectly acceptable, but I’ve had better at lower prices. Rupa joined me and ordered a martini as well. She specifically asked for olives – which they were out of – so got a lemon twist, which turned out to be a lime twist. As I watched them prepare hers I noticed they used Bombay instead of Gordon’s. The staff, in general, were accommodating and friendly, with the exception of one young bartender, who although he professionally tried to hide his apparent disinterest in being there, clearly wanted to be somewhere else – but maybe he was just having a bad day. The ceiling of the bar/restaurant is covered with tiny points of light creating a starry sky effect and, following this theme, their drinks menu offers a range of astronomically named specialty cocktails (Eclipse, Jupiter, Orian, etc.) at 16 Euros each. They were all heavy on fruit juice, of which raspberry, orange and grapefruit were fresh – the rest of the larger selection, bottled. Although I didn’t try one of these, they seemed to be a popular choice as the majority of the cocktails I saw being made were these fancy and brightly colored concoctions. Many people were opting for non-alcoholic options of soft drinks and juices, which ranged from 8.50 to 9.50 Euros. Otherwise, the clientele seemed to be sticking strictly with champagne or wine. And, that’s probably what I’ll do on my next visit. While my martini wasn’t bad, this venue is more appropriate for a bit of bubbly. I have heard that Ciel de Paris is a nice place to spend a good time because of the excellent service and delicious food. However, they should change the decoration.